The Course: A Brief History of Humankind: This is a Coursera course, https://class.coursera.org/humankind-002, that repeats regularly. It is the best history course I have ever taken. The instructor, Dr. Yuval Noah Harari, from the Hebrew University in Jerusalem comes across as brilliant, even as he makes history accessible to a lay person! There is a book as well, but Sean did not use it. 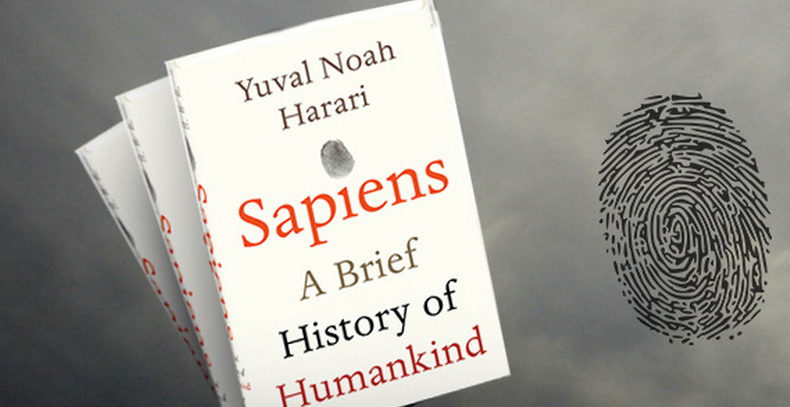 I did though, http://www.ynharari.com/sapiens-the-book/short-overview/. I read it, referred to it, and made a series of questions from it to accompany each lecture. Sean got a lot more out of the class that way. I did not have him write the answers, instead we would discuss them. Some of these questions took us far afield. It was a thought provoking quarter for history. The class is about the big picture not the memorization of dates and facts. Most people I know do not remember much history, probably because they just learned it for the test. History taught the way Dr. Harari teaches it is memorable. This was the second time Sean has taken this class. I was surprised when Sean asked to take it again at the start of this year. He took it a year ago! He wanted to work on the skill of note taking, and he felt he could get more out of this class a second time. His main reason though was that he liked this class that much! After giving it some thought, I decided that it would be like rereading a book you loved. You do get much more out of the book the second time reading. Both Sean and I have gotten much more out of this class the second time through. The text that I used to help me prepare questions. It was a great read! I thought about having Sean write 4 research papers for history over the 4 months that he took to complete A Brief History of Humankind. I opted for him to volunteer instead. There are only so many hours in the day, and he didn’t have time for both. The way we scheduled the class, without a writing component, was not time intensive. Sean and I watched the video lectures in the car on the way to crew practice. We discussed the salient points covered in the lectures using the guided questions I had put together. We (yes we) took the quizzes. By the way, I read over the quizzes when I was making the guided questions, after I had taken the quiz myself, to make sure we covered everything, and that Sean was very familiar with the terms Dr. Harari tested. 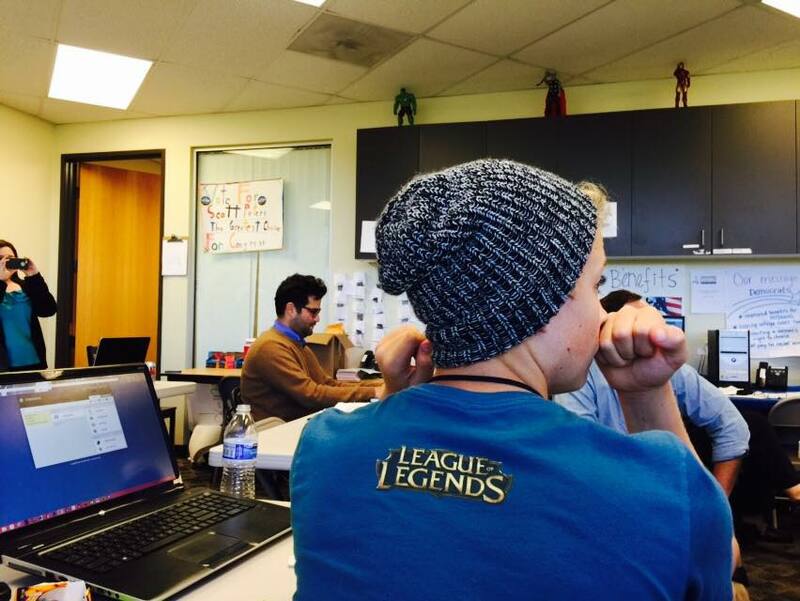 I felt it important that I take this class with Sean so that he had someone to talk with about what he was learning. I think history lends itself to intellectual discussion, and this provided a way for us to have intellectual discussions about topics I did not know much more about than Sean did. Volunteering: We feel strongly about volunteering at our house. We have volunteered for an animal rescue organization (http://www.projectwildlife.org/), helping kids learn to speak English in Delhi, India (http://www.crossculturalsolutions.org/), and now on a re-election campaign. 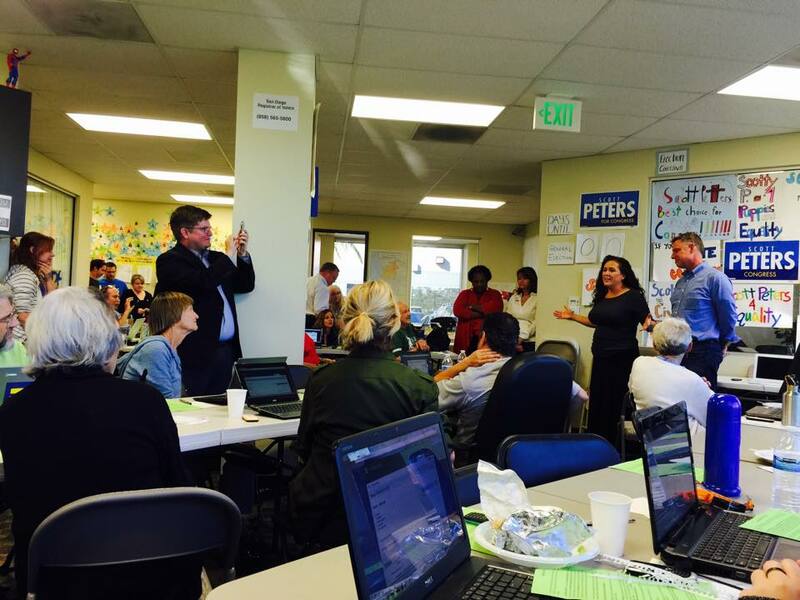 We worked on Scott Peters’ re-election campaign. Every election cycle we include the election in our history. I have been corrected by some people that politics are civics not history, but I do not agree with that distinction. Aren’t our political choices a big part of what drives history? We feel strongly about voting at our house. I think it is important to raise Sean in an environment where he is aware of what is going on in politics. I am raising a voter. I am also trying to raise him to be a critical thinker. I am not looking for him to agree with me on everything, or even vote as I do. I want him to come to his own understandings and beliefs about what is the best course. Democracies work best when all citizens vote. The issues and candidates you support might not win every time, but you will live in a more equitable and peaceful nation, because the majority of the people living in it voted, which means the majority of the people spoke about what and who they wanted for their nation. I could not wait to vote as I approached the age of 18. I grew up in a family whose members voted, often for different parties and differently on issues. We discussed our reasons, we talked about the issues, and we did not let it become divisive when we disagreed about them. I have voted every voting cycle since I was 18 years old, except for one when I could not make it to the polls in time. I want Sean to take voting as seriously as Jim (my husband) and I do. Sean is listening to the candidate speak. I think the best way to make sure Sean cares about voting and the issues facing our country is by participating in the process. This year Sean, Jim, and I volunteered on the campaign for a candidate running to keep his house seat. We watched the debates, learned about the issues, and paid attention to the results of the election. It made a difference to volunteer for a campaign because we were much more vested in the results. Sean is working the phone banks. This was a tough job. Most people do not want to speak on the phone to strangers about their political choices. We did A Brief History of Humankind this year too. 13 yo dd and I watched and took notes together and discussed. 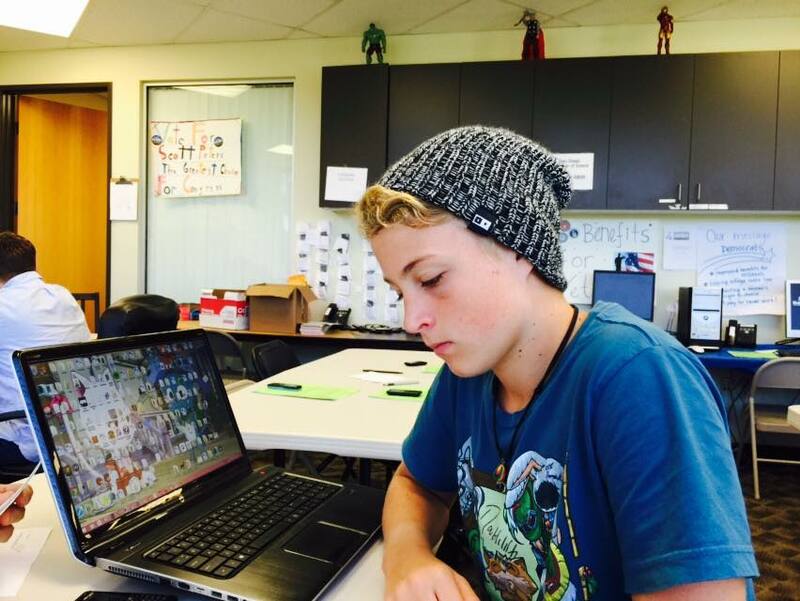 16 yo ds (a night owl) worked alone – normally when we were in bed. We’d discuss it the next day. I’m a trained historian and I didn’t agree with everything he said or his approachi its entirety – but that made for good discussions! We’d worked through Big History online first – that was going to be our history for the year but then I discovered the Coursera course and decided they’d complement and contrast with each other nicely. Just the other day we read an article in the paper and discussed how it fitted in with Harari’s theories. I agree with you about the importance of voting. At last year’s elections (I’m in New Zealand) both my older children could vote and between them, my husband and I, we voted four different ways! Which is great. I’m just glad they voted – so many of their peers . History at your house sounds like science at mine. I have an idea for how to homeschool history during the big election cycle in the US, which is next year. I will be posting about it as soon as I get finished with the first draft of Astronomy and Earth Science. It would be awfully cool to get outside perspectives of the elections in the US. Voted 4 ways, how many parties do you have? And do they all have a shot at getting elected? My husband is not a fan of political parties. He would like to see the party system in the US abolished. I would love to hear what parts of ABHoH you did not agree with. I do not know enough about history to know which parts academics would disagree with in this course.